I love Noodles... Like I can have them as if there is no tomorrow. My mom often smirks at me and tells me that I should have been Chinese. I love to carry Noodles for lunch and eat the same thing for dinner and next day for breakfast as well and still not get bored of it. I'm happy to share my life with a North East guy(read North East which is almost close to China according to my terrible geography). He is more like me or should I say we click together because of our love towards Chinese/Indo-Chinese food. So I can give him Schezwan Noodles, Veg Noodles or Chilly Butter Noodles in a week and he will happily complete his dabba. 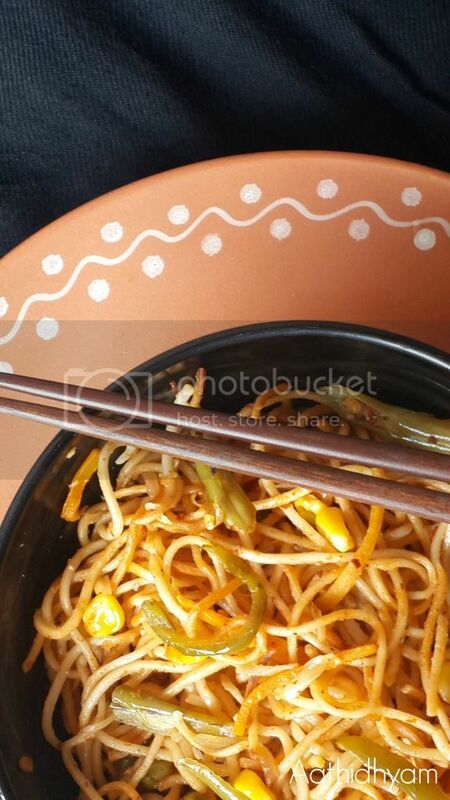 When I went to Mainland China like a year back, Mr.P ordered Chilly Butter Garlic Noodles. I loved it to the core - it was buttery, garlicky and very mildly spiced.I wanted to replicate the same at home and went by what I could guess. My first 3 attempts were bad. After a couple of trial and error methods, I was able to come up with this dish and it is pretty much close if not there. This recipe is surely a keeper and a winner as well. 1) Cook noodles as per packet instructions. Drain and add little oil and mix it. This prevents sticking. 2) In a pan, melt butter and add oil as well. 3) Fry ginger and garlic until the pungent smell subsides. 4) Add onions and fry for 30-40 secs. They need to be crisp not soft. 5) Add remaining vegetables and turn the flame to high. Fry for a min. 6) Now add Schezwan paste + sauces, salt, pepper powder, garlic powder, oregano. 7) Fry for 2-3 mins. Now add noodles. 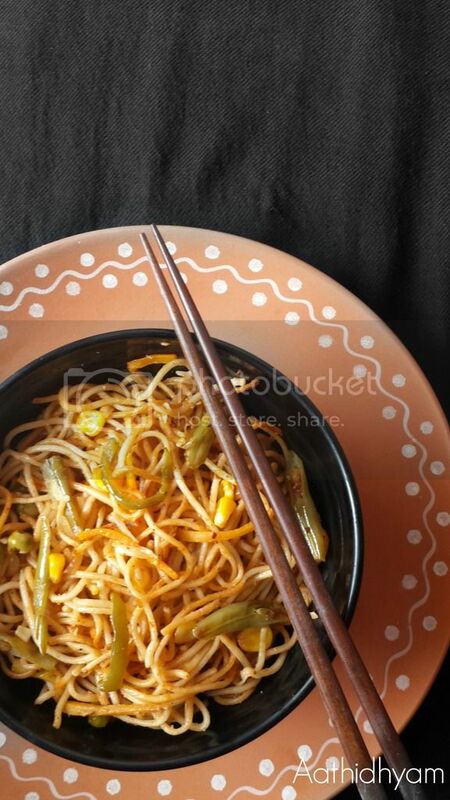 Combine all the ingredients well so that vegetables and masala coat the noodles. 8) Check salt and serve hot. 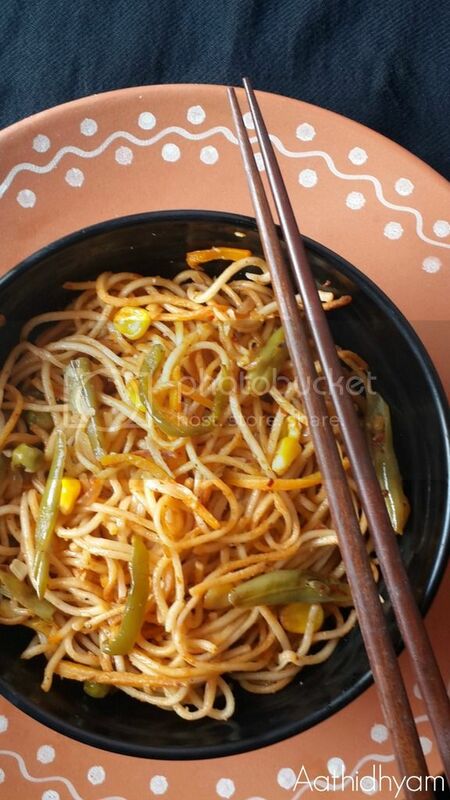 1) I used Chings Veg Noodles. You can even use Egg Noodles. 2) If you don't like too much of garlic just reduce it to 1/2 tsp.